Enter location or drill-down on the map below for your local report location. Click the magnifying glass to search the entered location before generating a report. Are you moving to a new area or are you interested in seeing how your current property compares in todayâ€™s real estate market? 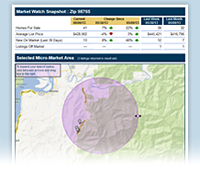 Let us find you the most current prices, listings and trends in any market area. Just follow our 3 easy steps below.